Air vents to increase ventilation of knee and shinbone. Knee, tibia and femur protection in plastic and EVA padding. ACERBIS IMPACT EVO 3.0 KNEE GUARDS. EN 1621-1/2012 CERTIFIED. CE Level 2 Approved Hip Protectors for Motorcycle kevlar jeans, leggings, trousers. Level-2 Hip Protectors / Pads. HIP PROTECTORS. 0256-206 - Oneal Pumpgun II MX Pivot Type Carbon Knee Guards. Oneal Pumpgun II MX Pivot Type Carbon Knee Guards. TheOneal Pumpgun II MX Pivot Type Carbon Knee Guards are part of the latest Oneal collection. NO FEAR EMPIRE RASH VEST ROOST CHEST PROTECTOR. • Featherlight under jersey roost protection. MATT GARDINER MX. SIZE: ADULT LARGE (42" - 44" CHEST). • TPR chest logo. BUY NOW £19.95 The empire protective series is designed to withstand the most punishing actions so you can focus on what is really important…. Black Hard ABS Plastic Mold Shell Velcro Backed Knee Sliders for Motorcycle Trouser Pants - Set of 2. 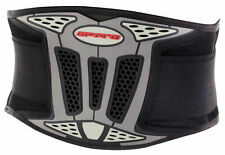 Sector knee guards S11 black. Wulfsport Youth Deflector Jacket. Wulfsport International. 128 (approx 3-4 yrs). 146 (approx 5-7 yrs). 164 (approx 8-10 yrs). 176 (approx 11-13 yrs). Check availability with our specialists. Front zip fastening with Velcro neck fastening.